The next licensed puzzler is cute and addictive! 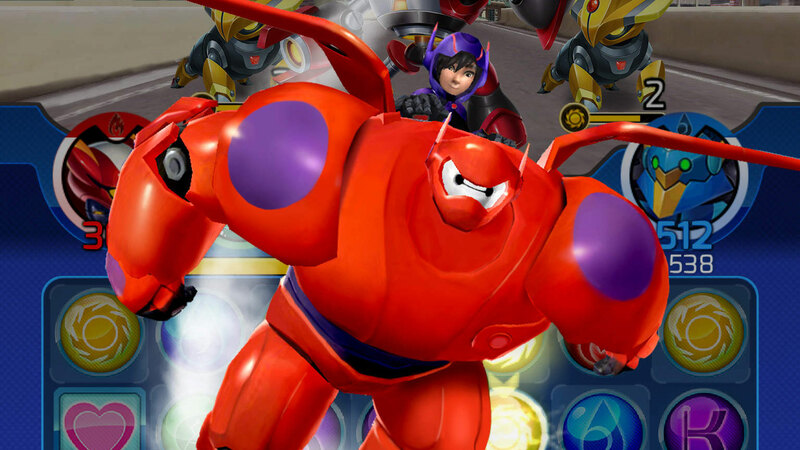 Big Hero 6 is the latest game to have joined the Disney stable in the realm of match-3 titles. As a tie-in to a modern animated film it could be extremely barebones, but luckily it follows in the footsteps of the excellent puzzle match games that came before it. This is one free-to-play title that you'll actually want to download and spend time with. If you haven't seen Big Hero 6, you don't need to worry about the game spoiling the film for you. It's a simple cut and dry affair that follows young Hiro Hamada and his cuddly-looking white robot. You spend more time, however, with other bots as the title implies, by using a lucky cat capsule game and completing missions as well as fighting off enemy robots. Combat is very much the same as in games like Puzzle and Dragons or Doctor Who: Legacy. Make similar elemental matches to attack and stave off advancing enemies. You can arrange combos to do additional damage, and the better you do, the more bots you can expect to receive in turn. It's a fairly addictive cycle, even if it's one you're probably familiar with. After you complete missions and fight off enemies, you're stuck dealing with a lack of energy that feels longer and longer to replenish each time you deplete it. When the game is so simple, quick, and addictive, this severely limits the amount of time you can spend in-game without resorting to purchasing currency (Prisms as they're called) to be able to continue when you're ready rather than being forced to wait. Big Hero 6: Bot Fight isn't the most original match-3 puzzler on the block, but for a licensed title and simple match game it's pretty fun, acting as at the very least a substitute for when you're waiting for energy to drop on its bigger brothers. And you've gotta hand it to Disney for not going the route of yet another endless runner. Jeez. Download Big Hero 6: Bot Fight for iPhone, iPad, and Android.